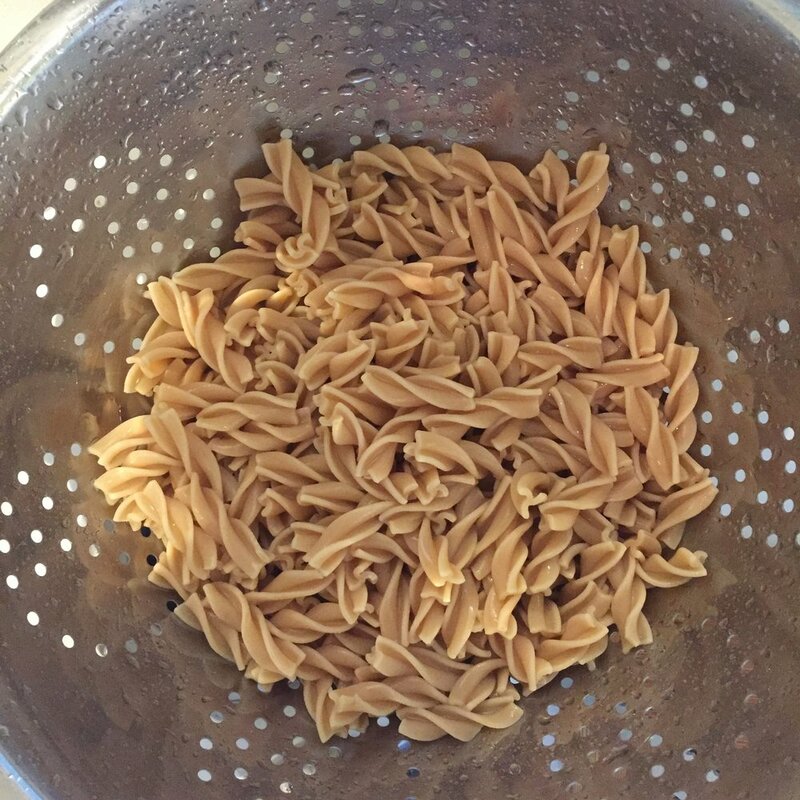 This week I made my fifth recipe using Banza chickpea pasta. Banza does not pay me but they did send me six free boxes of pasta, which I really appreciate. The ingredients in Banza are chickpeas, tapioca, pea protein and xantham gum. Banza is vegan, gluten-free, soy-free, nut-free and egg-free. Banza contains two times the protein, four times the fiber, and half the net carbs of regular pasta. To find out more, including where it's sold and how to order, visit eatbanza.com. I am a pasta lover. Whether it's homemade white pasta at a restaurant or the heartier whole wheat pasta I typically make when cooking pasta at home, noodles plus sauce plus toppings will always be one of my favorite meals. The thing I love most about Banza pasta is that it TASTES LIKE PASTA. If you like the flavor of pasta, you'll like the flavor of Banza. There is no discernible difference. Getting a big protein and fiber boost is an absolute bonus, but first and foremost I care about flavor. Speaking of flavor, to make my stroganoff I turned to a recipe that is creamy, luxurious, and full of rich mushroom flavor. Normally I like to tweak or change recipes, but I followed this one to a T and I'm so glad I did. In my opinion it's a flawless recipe. It was created by Molly Patrick, the co-founder of Clean Food Dirty Girl. She's badass and her recipes are delicious. This particular one was posted at One Green Planet and you can find it here: Vegan Mushroom Stroganoff. I can tell I'm going to like a recipe because it's full of real ingredients like veggies and spices. What I gravitated to most in this recipe was the earthiness of two different kinds of mushrooms, the freshness of parsley, and the richness of veggie broth and a little vegan sour cream. I cannot emphasize enough how much I am not paid by Banza despite the fact that I love pimping their product. Look at the richness of this sauce! I made a special trip to the store yesterday when I realized I was out of onions because obviously there's no way to make this dish without a beautiful yellow onion. Where are the chickpeas? Absolutely undetectable. Banza tastes, looks and feels just like regular pasta. Just don't forget to rinse it after it's cooked. If you do forget, there will be a gummy, starchy quality to the pasta. So don't forget. I hated cooked mushrooms as a child. I would only eat white button mushrooms raw and dipped in A-I steak sauce. I couldn't handle the texture or flavor of cooked mushrooms. Then I grew up and everything changed. There are few things I like more than rich, sautéed mushrooms. I love the simplicity of this dish. It shouldn't take a million ingredients to achieve a delicious flavor profile. I make some exceptions to this rule, but in general if I see lots of ingredients in a recipe, I run away and opt for something simpler instead. I have a big appreciation for people who make recipes that require minimal ingredients and time. Stroganoff is the ultimate comfort food, especially now that the weather is turning cooler. I love that this dish is both classic American comfort food and also a super modern twist that can appeal to a variety of eaters. This dish is gluten-free, soy-free, egg-free, dairy-free, and nut-free. Yet at the end of the day, it's just simple, yummy, crowd-pleasing food.